Hundreds of European tourists have been refused entry to Libya after an unannounced change to passport rules. From the evening of 11 November, visitors without an Arabic translation of their passports have been denied entry, even if they have valid visas. Libya is the only Middle Eastern country to take such a step. Correspondents say the sudden change of policy appears to go against Tripoli's recent attempts to promote itself as a western tourist destination. No warning of the change was given to foreign embassies. "It was completely out of the blue" an official at the British Embassy in Tripoli told the BBC News website. "The consular department has written to request an explanation and we haven't received a reply yet." Switzerland has lodged a formal complaint to Libya after about 40 air passengers on board a Swiss carrier were denied entry to Tripoli on Sunday. The travellers were forced to return to Switzerland on the same plane later that evening. More than 170 passengers on board a charter flight run by France's Air Mediterranee had to do the same. They were not allowed to get off their plane which had landed at Sebha airport, in southern Libya. A passenger on board the P&O cruise ship Artemis has contacted the BBC to say the vessel was not allowed to land passengers in Tripoli on Tuesday morning for a planned day trip. A P&O spokeswoman said the vessel was heading to its next destination, Malta, earlier than scheduled. 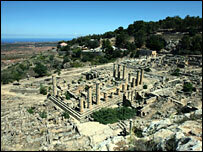 Libya's status as a tourist destination has grown since UN sanctions were lifted in 2003. Colonel Muammar Gaddafi's son, Seif al-Islam, unveiled a plan in September to protect and promote Libya's ancient archaeological sites and unspoilt Mediterranean coastline. Have your travel plans been disrupted by Libya's passport rule change? It's not just visitors without an Arabic translation of their passports who have been denied entry. Libyans travelling abroad had the English page of their passports scribbled over which resulted in many Libyans being denied entry to western airports because of their tampered passports. As always, these absurd decisions will be overturned when they get the required attention. The only person in Libya who has the power to make such decisions is Gaddafi himself. It's not only tourists, it affects those of us who work here as well. The authorities are also cancelling the English translation in Libyans' passports, rendering them unusable in non-Arabic countries. This seems to be symptomatic of a behind-the-scenes struggle between Seif and the modernisers on one hand and the old guard on the other. A few weeks ago they started putting up bilingual road signs (currently everything is in Arabic only) then took them down again. My husband visited Libya recently to visit his family. He is a Libyan citizen, but due to the current confusion there are rumours that even Libyan citizens are being banned from leaving the country. Immigration is ripping off the English section of the passport and banning Libyan citizens from travelling out of Libya. The government's indecisiveness is really confusing and dismaying. I had been invited as a speaker at an international conference of university vice chancellors and presidents in Tripoli last month. A letter from the host university was sent - assuring us that arrangements had been made to give visas at the port of entry. On arrival, we discovered that the rules had changed, and all of us with US passports were detained at the airport. We were being expelled and were waiting for flights back to Europe when the Education minister finally intervened. In all, I spent more than 19 difficult hours at the airport. I will not be returning to Libya soon. Much to celebrate after 40 years? Has Gaddafi been good for Libya?